Ever get the feeling you’ll never find the perfect pre workout supplement? Believe me, I know that feeling. Even on the rare occasion when you actually find something that really knocks your socks off the first couple times you use it, that excitement wears off in a week or two when your body starts to build a tolerance. The honeymoon period is over, and the search is back on. We all want to get off that roller coaster and find something that works like gangbusters continually. The problem is most pre workouts rely heavily on stimulants like caffeine for the bulk of their performance. And by its very nature, caffeine on its own is not going to give you beneficial results over the long term. It’s helpful, but only when supported by a well thought out, well rounded formula that covers more than just getting you hyped up to head to the gym. So if a pre workout wants to perform for you week after week, it’s got to provide more than just the usual status quo when it comes to ingredients. Brand new to the market, 4 Gauge pre workout promises to be different from everything else you’ve tried. By using the right ingredients in the clinical studied correct amounts, it delivers benefits unmatched by everything that’s come before. It’s important to first talk about what kinds of benefits and effects you can expect from 4 Gauge. You might think all pre workouts strive for the same results, but that’s not actually the case. Some focus almost exclusively on stimulant energy, while others are all about the pump. Some attempt to improve the mind/body connection while others attempt to boost the power of each lift. Some pre workouts show more ambition by working to affect each of the aforementioned areas, but come up short by biting off more than they can chew. 4 Gauge definitely strives to provide a broad range of benefits for the serious bodybuilder and athlete. Simply stated, the goal of this product is to provide: STRENGTH, FOCUS, ENERGY, and PUMP. STRENGTH provided by increased power output from your muscles and the will and mind connection to use it. FOCUS to allow you to maintain optimal concentration and will as well an hour into your workout as it is when you first get started. ENERGY to keep training harder longer into your workout with precision and effectiveness. PUMPS to fill your muscles with the oxygen and nutrients required to get you the results you deserve. It’s that 4-in-1 principle that provides the first real clue that 4 Gauge might be something different. One important fact about the 4 Gauge formula is that it doesn’t use proprietary blends. This means, unlike many other supplements you’ll find out there, this one tells you not only what’s in it, but how much. A lot of guys may underestimate the importance of this, but if they do so at their peril. A supplement can list all the hot and trendy latest ingredients in their formula, but if they’re couched in a proprietary blend, you don’t know if you’re getting 1 mg or 1,000 or more. Without that crucial information, it’s impossible to tell if said ingredient will have any effect at all. Take caffeine as an example. Let’s say caffeine is listed as a supplement ingredient within a proprietary blend. You don’t know how much there is, so you have no idea what it will do. If there’s 10 or 20 mg, you will hardly know it’s there. If it’s 400 mg, you’ll most likely get some serious jitters, and you’ll have to be very careful to avoid other caffeine sources to make sure you don’t end up with more serious side effects. If the caffeine is listed within a proprietary blend, it’s impossible to know which scenario you’re looking at. L-Citrulline (6,000 mg) delivers on 4 Gauge’s promise to provide massive muscle pumps. It’s an amino acid found in watermelons that converts in the kidneys to L-Arginine. No doubt you’ve heard about L-Arginine and how it increases nitric oxide production. With increased nitric oxide, your blood vessels dilate, allowing more blood, carrying more oxygen and nutrients, to be delivered to your muscles during your workout. The increased blood volume provides that vascular look, the increased oxygen provides energy to sustain your efforts throughout the workout, and the increased nutrients provide the needed components for recovery after your workout. 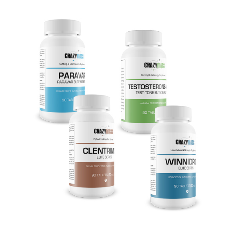 The advantage of L-Citrulline over supplementing L-Arginine directly is that by using L-Citrulline, you maintain the effect over a longer period of time. According to published studies, the 6,000 mg dose is optimal to improve exercise performance. Caffeine (150mg) and L-Theanine (200 mg) Stack provides smooth clean energy and focus to get your workout started on the right foot and to keep you going throughout. Caffeine is used in the majority of stimulant pre workouts. It provides energy, focus, concentration, and increased will to continue. L-Theanine is an amino acid found in green tea that counteracts the negative effects that can come along with caffeine. It promotes of feeling of relaxed calm that pairs perfectly with the more hard charging effects of caffeine. While the caffeine amps you up, L-Theanine keeps you in calm control of your excited energy. You’ll find this combination more and more in not only pre workout supplements, but brain boosting cognitive enhancers as well. The 150 mg dose of caffeine is about what you’d get from a cup of coffee, so it’s effective without overdoing it. While the 200 mg L-Theanine dose is the most common recommendation using the most effective ratio. Rhodiola Rosea (100 mg) is what’s called an adaptagen. It helps your body respond appropriately to stressful situation, which working out is. It fights physical and mental fatigue as well as boosting mood and combating depression. Including Rhodiola Rosea in the 4 Gauge formula helps keep you upbeat through the tough stretches of your workout. The 100 mg dose is on the low side of the recommended 200-600 mg per day, so the effect of this ingredient may not be as strong as one would prefer. Red Beet Root Extract (300 mg) is another nitric oxide booster. It contains vegetable nitrates which are converted to nitrites by the body. Nitrites increase the amount of nitric oxide in your system, which can and will increase your muscle pump. Recommended doses of Beet Root Extract are hard to come by, but in the end, the most common recommendation is approximately 450 mg.
Creatine Monohydrate (1000 mg) is the most well-studied workout supplement ingredient on the planet. Basically what it does is provide the ability for your muscle cells to store energy, or ATP. ATP cannot be stored on its own, but creatine can be stored, and it converts to ATP when needed. Creatine Monohydrate is the most widely used and studied form of creatine. Its primary effect is to increase your muscles’ power during workouts. You push more weight and you can do so for longer, leading to faster, better overall results. The 1000 mg is on the low side of a maintenance dose. You may want to take additional creatine during a load up phase, then back off to just using what’s in 4 Gauge after you build up your stores. Acetyl-L-Carnitine (500 mg) can increase your body’s ability to burn fat. It’s commonly used in pre workout supplements for its many varied, yet related, benefits. It improves alertness by supporting neuronal activity in the brain. It fights against fatigue. And it bolsters the process by which fat is converted to energy. The recommended daily dose is 500-2,000 mg.
Coconut Water Powder (300 mg) can provide nutrients and electrolytes that may otherwise be depleted during rigorous exercise. This can lead to maintenance of necessary levels of hydration to keep up energy and optimal output during your workout. There are really no studies referencing the benefits of supplementing with Coconut Water Powder, which means there is no recommended daily dose. 4 Gauge comes in powder form. The label instructs that a single dose is equal to 2 scoops. Mix 2 scoops with about 10-12 ounces of water and drink about 20 to 30 minutes before heading off to your workout. The effects should last anywhere from 2 to 4 hours, decreasing slowly throughout that time, without a final crash. After beginning with the 2-scoop dose, it is permissible to experiment with higher doses, up to 4 scoops at at time, but make sure you start with the recommended dose and increase slowly. None of the ingredients in 4 Gauge, with the exception of caffeine, are known to frequently cause side effects. As far as caffeine side effects go, anyone can get a bit racy and jittery with too much, but the 150 mg dose is pretty optimal for avoiding that. That said, if you combine 4 Gauge with other caffeine sources, you’d be more likely to find yourself feeling uncomfortably stimulated. As with any source of caffeine, it’s up to you to monitor and regulate your intake for your tolerance. Of course, as with any supplement, there are no guarantees that they be side effect free. Factors such as any allergies or tolerances you may have will affect the potential occurrence of side effects. At this time, 4 Gauge is only available through their official website. They don’t engage in any of the “free trial” scam programs that you find with a lot of other products. Just straight up one-time ordering with straight up one-time prices. The most basic package is called “One Round.” It’s one shotgun shell shaped bottle containing 20 2-scoop servings for $45.00. The middle package is called “Two Rounds,” containing 2 bottles for $90. The biggest package will save you half off your third bottle. You get 3 bottles for $112.50. 4 Gauge is not available in brick and mortar stores or through other online retailers like Amazon.com. It’s exclusively sold through the official website. 4 Gauge is brand new to the market, so there really isn’t much in the way of customer feedback floating around the internet yet. There are a few testimonials on the 4 Gauge website, and they are unsurprisingly all favorable. A common thread is that these happy customers seem to have all used other pre workouts in the past with little or no success, and they find 4 Gauge to be completely different, providing them mainly with energy and motivation to get to the gym. I suspect there will be more reviews and testimonials popping up not that 4 Gauge has become available worldwide. We’ll keep an eye out for them and keep you posted. I also plan to try it soon, so come back in a few weeks to see my own personal results. Ingredient amounts are listed and they show most of them to be used in clinical doses. The caffeine/l-theanine stack will provide smooth, clean energy with no jitters and no crash. There is scientific research backing up the use of several of the primary ingredients. There’s no free trial scam to worry about. It can get a little expensive, especially if you find yourself using more than the basic 2-scoop dose. There are no independent customer reviews yet to demonstrate how it’s working for real people in the real world. There is currently no money back guarantee offered on 4 Gauge. After reviewing so many supplements over the years, it’s rare that I get excited about a new product coming out. But I have to say, I am excited about 4 Gauge. The formula is well-dosed where it counts, and it addresses each point of concern when it comes to what pre workout supplements are supposed to be all about. I especially like the caffeine/l-theanine stack for smooth energy and focus and the hefty L-Citrulline dose for pumps. Without having used it yet, I feel as comfortable as possible recommending that you give it a try. I know I will, and I’ll update this page with my results soon.